There are now new boat services along the Potomac that will drop you off right next to the cherry blossoms. There are a number of ways to get to the cherry blossoms. By boat might be about the most scenic (other than walking). 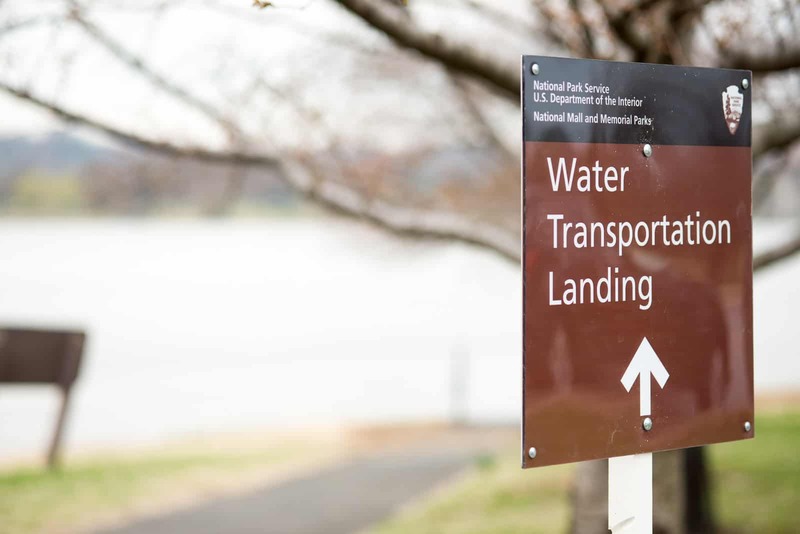 There's a boat landing point on the bank of the Potomac next to the FDR Memorial. It's not a pier--it's just a paved section of the riverbank--but it's a jumping on and off point for two commercial ferry/water taxi services. It's not the cheapest option and the schedules are a bit limited, but if you're put off by the traffic and parking problems when the cherry blossoms are in bloom, this might be a good option. It's an especially good option if you're staying in Old Town or National Harbor. It'll put you out within a couple of hundred yards of the Tidal Basin. A few years ago there were a few vendors experimenting with the service, but it appears to have been whittled down to one in recent years: the Potomac Riverboat Company. They offer a scheduled water cruise service that runs between National Harbor, Old Town, and the National Mall. The schedule varies by weekend vs weekday. The Potomac Riverboat Company's 2016 cherry blossom services start limited service on the weekend of 19 and 20 March. Please note that the cruises do not stop at the National Mall stop mentioned above until after April 2. The cruises last approximately 50 minutes and cruise along the outside of Hains Point and along the Potomac, where you can take in the thousands of cherry blossoms lining Hains Point and several monuments from the water. They do not go on the Tidal Basin itself--the only boats allowed there are the paddle boats. Since they originally posted the schedule on their website the bloom predictions were moved forward. So they've added some earlier cruises that aren't yet, as of the time of writing, showing up on their website. But I've confirmed these directly. There earlier cruises are March 19 (Sat), 20 (Sun), 25 (Fri), 26 (Sat), and 27 (Sun). Advance reservations are recommended because it's likely to be busy (book online here), but it's also possible to buy tickets at the booths at the docks (boarding is 15 mins before scheduled departure). For ticket prices and their schedule after March 31, please see their website. Again, please note that the cruises don't stop at the National Mall stop until after April 2.